"Encourage guests to squeeze the juice from the lemon wedges on to the salad." In a medium saucepan, bring 1 3/4 cup water to a boil. Stir in couscous; cover. Remove from heat; let stand, covered, 5 minutes. Cool to room temperature. Meanwhile, in a medium bowl combine oil, lemon juice, salt and pepper. Stir in cucumber, green onion, parsley, basil and couscous. Mix well and chill for at least 1 hour. Line a plate with lettuce leaves. Spoon couscous mixture over leaves and garnish with lemon wedges. Bright and zesty quick chicken dinner! I think it needs a little more flavor. Next time I would add some minced garlic and more spices. My husband and I loved it!!!! 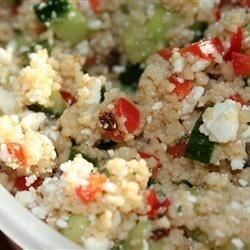 I added some feta cheese and a can of tomatoes and it added so much to the flavor. We will be doing this agian soon!!! I love couscous but I prefer having more veggies than grain so I pumped up this recipie a bit by adding celery and tomates too. Regardless, this is a great recipie. This is one of my husband's new favorite recipes. Light and healthy, but filling. We usually put the mixture in a wrap or pita to eat it. This is a good cold salad that's easy enough to make. I would recommend cutting back on the water a bit, though, so the herbs and spices are a little more prevalent.